Industrial high pressure fans, OEM centrifugal and axial blowers, high temperature ventilator fans. Sales for roof and wall exhaust and supply fan blowers, radial blower fans, tubeaxial ventilators. Chicago Blower Canada is a leading supplier of industrial and commercial fans, ventilators, blowers and accessories for various air-moving fan applications. Chicago Blower offers a complete line of centrifugal fan equipment, from small Baby Vent Fan Sets capable of moving a few cubic feet per minute (CFM), to large, heavy-duty industrial mechanical draft fans with capacities to 1,000,000 CFM and with static pressures from 0" Water Gauge (WG) to 150" WG. 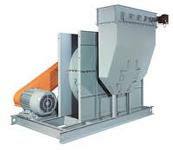 Chicago Blower products include standard centrifugal fan and customized blowers designed to meet our customers' requirements based on Chicago Blower manufacturing standard. Over the years Chicago Blower / Canada supplied centrifugal fans to a wide range of industries and applications including: combustion air supply, material handling, process ventilation, ovens and dryers, iron and steel industry, mine and tunnel ventilation, petro-chemical, power generation, marine and off-shore structures, pulp and paper, HVAC, paint / spray booths, fertilizer and various emission control applications. For the commercial HVAC market, Canadian Blower offers general ventilation fans for institutional and retail buildings, schools, restaurants and hospitals. Special materials, construction, explosion-proof and spark-resistant design, variety of coatings and accessories are available to meet practically any application needs. Chicago Blower fan repair, retrofit and service shop provides complete rebuilds, shaft repairs, blade liners, in-field balancing, vibration analyses, performance upgrade, increased fan capacity, all metallurgies, all type of fans repair, and emergency service on all sizes and designs. Chicago Blower air moving products are best know for "industrial quality" assuring reliable performance, relentless dependability and longevity. A staff of specially trained engineers will design a dependable fan that exactly fits customers' dimensional and performance requirements. Chicago Blower fans and blowers are sold and serviced by air moving experts that can evaluate your needs and provide best recommendations for your application. - Versatility... various accessories, modifications, arrangements available: spark-resistant, explosion proof & high temperature construction, shaft seal, roof fan arrangement with stack hood, mounting legs, suspension support, OSHA guards, access door, housing drain, inlet bell, stainless steel ventilator construction, "easy-access" swing-out, vibration isolators.